Notes As of December 31, 2012, Douglas County Bank had approximately $316.5 million in total assets and $314.3 million in total deposits. Hamilton State Bank will pay the FDIC a premium of 0.5 percent to assume all of the deposits of Douglas County Bank. In addition to assuming all of the deposits of the failed bank, Hamilton State Bank agreed to purchase approximately $260.9 million of the failed bank's assets. The FDIC will retain the remaining assets for later disposition. Notes As of December 31, 2012, Parkway Bank had approximately $108.6 million in total assets and $103.7 million in total deposits. 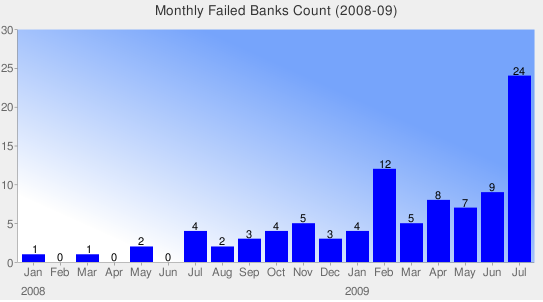 In addition to assuming all of the deposits of the failed bank, CertusBank, N.A. agreed to purchase approximately $99.2 million of the failed bank's assets. The FDIC will retain the remaining assets for later disposition. Notes As of December 31, 2012, Heritage Bank of North Florida had approximately $110.9 million in total assets and $108.5 million in total deposits. In addition to assuming all of the deposits of the failed bank, FirstAtlantic Bank agreed to purchase essentially all of the assets. Notes As of December 31, 2012, First Federal Bank had approximately $100.1 million in total assets and $93.9 million in total deposits. In addition to assuming all of the deposits of the failed bank, Your Community Bank agreed to purchase essentially all of the assets. Notes As of December 31, 2012, Frontier Bank had approximately $258.8 million in total assets and $224.1 million in total deposits. In addition to assuming all of the deposits of the failed bank, HeritageBank of the South agreed to purchase essentially all of the assets.